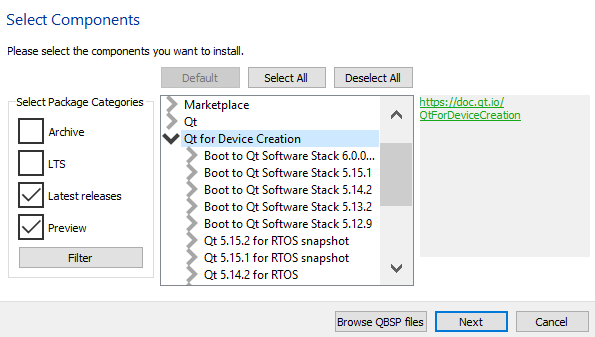 You can install the Boot to Qt software stack via the online installer. On Linux, see General Installation Issues for Linux. To flash the image, you can use either Toradex Easy Installer or Qt's Flashing Wizard. With Toradex Easy Installer, the image is flashed to the device's internal eMMC flash memory. Flashing Wizard uses an external SD card. When Toradex Easy Installer is connected to the Internet, it automatically provides the latest Boot to Qt image in its image list but that is not necessarily compatible with your Boot to Qt installation. When you flash with Toradex Easy Installer, you should always use the *.tezi.tar package that is included into the Boot to Qt installation. If your target device does not have the pre-installed Toradex Easy Installer, follow instructions in Load Toradex Easy Installer to load Toradex Easy Installer. Your Boot to Qt installation has the *.tezi.tar package under <Qt installation directory>/<Qt version>/Boot2Qt/<target>/images. Extract the package to an SD card or a USB flash drive. Flash the image from the SD card or the USB flash drive with Toradex Easy Installer. See Install Images with Toradex Easy Installer. Note: If you are using the Apalis evaluation board, you need to use the first SD card slot (X18). In order to boot from the external SD card, U-Boot needs to be updated. Connect a serial cable to the device and enter into the U-Boot environment by pressing any key before the autoboot. Updating to fast boot mode prevents easy downgrading to previous BSP versions. You can answer with y.
Reset or power cycle the device to start the new U-Boot. New U-Boot commands are now stored into the device. For more information about the boot process on Toradex Apalis iMX6, see Toradex Linux Booting. Boot to Qt is configured for the Ixora carrier board v1.1 with a capacitive touch display. If you use different carrier board, you may need to change a U-boot environment accordingly. The Ixora carrier board has a USB 2.0 OTG interface available on a Micro-AB connector (X9). The jumper JP2 must be set to open position to enable the OTG mode and make Qt Creator communication via this USB interface possible. For more information see Ixora Datasheet. When you flash the Boot to Qt image with Qt's Flashing Wizard and you are using the Apalis evaluation board, you need to use the first SD card slot (X18).